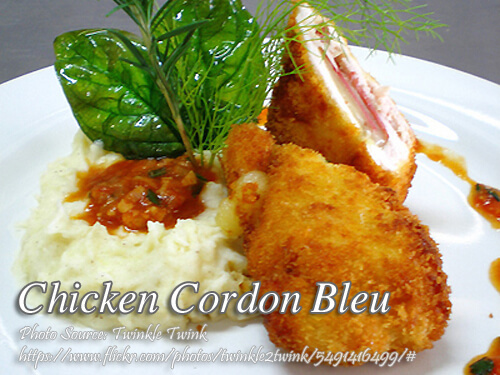 Cordon Bleu is a Foreign dish, which I think originated in Switzerland. The original Cordon Bleu is veal, pounded thin and wrapped around in ham and cheese then breaded and deep fried. Chicken cordon bleu is a variant and uses chicken fillet instead. It is also wrapped around in ham and cheese. Because of it’s popularity, it made it’s way to us and also became our favorite. To cook this dish; Pound chicken breast to flatten. Season with salt and pepper then set aside. In a bowl, season flour with salt and pepper. In another bowl, season breadcrumbs with salt and pepper. Arrange bowls in this order: seasoned flour, beaten eggs and seasoned breadcrumbs. Line flattened chicken breast with sliced ham. Place cheese stick on top and tuck in edges of chicken and form into a log. Dip chicken in the seasoned flour mixture, then dip in beaten egg and dredge in seasoned breadcrumbs. Freeze. Fry in hot oil until cooked. Drain on paper towel lined pan. See below for the complete recipe with the list of the ingredients with exact measurements. Chicken cordon bleu is a variant and uses chicken fillet instead. It is also wrapped around in ham and cheese. Pound chicken breast to flatten. Season with salt and pepper then set aside. In a bowl, season flour with salt and pepper. In another bowl, season breadcrumbs with salt and pepper. Arrange bowls in this order: seasoned flour, beaten eggs and seasoned breadcrumbs. Line flattened chicken breast with sliced ham. Place cheese stick on top and tuck in edges of chicken and form into a log. Dip chicken in the seasoned flour mixture, then dip in beaten egg and dredge in seasoned breadcrumbs. Freeze. Fry in hot oil until cooked. Drain on paper towel lined pan. Thanks Panlasang Pinoy Meaty Recipes for the delicious food you published. It’s a big help in preparing daily meals. Keep up the good work! Your recipes are delicious, thank you Panlasang Pinoy Meaty Recipes! Hi Yam, the reason why you need to freeze it before frying so the ham and cheese wrapped in chicken fillet will remain intact when you fry it. Hi, thanks for the recipe. How long do we need to freeze it before frying? Thanks! Hi Mika, I think 4 to 5 hours is enough as long as the chicken is already frozen and hard. Hi Hazel, Please reduce the heat while frying and as much as possible fry in very low heat. This is a simple sauce for the cordon bleu: Heat 2 tablespoon butter until it start to smoke. Stir in 2 tablespoon cornstarch, mix well until it forms a lump. Heat a cup of fresh milk in a separate pan until it starts to boil then add to the butter-cornstarch mix. Simmer 1-2 min to thicken. Season w/ salt & white pepper powder.